Hong Kong Tiananmen Anniversary: Tens of thousands of people attend a candlelight vigil at Victoria Park in Hong Kong, Saturday, June 4, 2016, to commemorate victims of the 1989 military crackdown in Beijing. Twenty-seven years is a long time to keep the flame alive for a memorial event, especially one for a massacre that took place more than 1,000 miles away. This is the situation facing Hong Kong’s annual vigil for the June 4, 1989 crackdown in and around Tiananmen Square in Beijing, where hundreds of unarmed student protesters were killed. 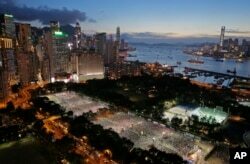 Each June 4, tens of thousands of mourners turn Hong Kong’s Victoria Park into a sea of candlelight. A funeral procession winds its way through the crowd, videos of the bloody crackdown are shown on giant outdoor screens, and political leaders shout slogans through megaphones. It is only in this city, a former British colony with a high degree of autonomy, that such a mass outpouring could take place within China. On the mainland, Beijing has banned all commemorations, and censors media and online mentions of the event. Tens of thousands came out to the venue late Saturday evening. At one entrance to Victoria Park that faces a busy commercial area that is popular with Chinese tourists, activists aimed banners and megaphones at those passing by. Hong Kongers, some with small children on their shoulders, stopped to sign petitions, donate change or buy t-shirts with “6489” on them. To the beating of drums, the crowd bowed in the traditional Chinese fashion - three deep bows to honor the dead. An anthem was sung as well as all of the participants raised candles in the air. The sheer size of the Hong Kong event is still impressive, though numbers have fallen in recent years. Most people under the age of 35 have no direct memories of the 1989 crackdown. Crowd numbers hit a high of 200,000 during the vigil’s 20th anniversary in 2009. (The police put it at 100,000). There was also high interest during the 25th anniversary in 2014. Numbers fell to 135,000 last year, and 125,000 this year, according to organizers. For the first time this year, Hong Kong student groups disagreed on whether to partake, or even criticize the vigil. The Hong Kong Federation of Students said that instead of participating formally in Victoria Park, they would hold forums on the future of Hong Kong – a subject that many youth feel is more pertinent, especially after the Occupy Central demonstrations of 2014. Several incidents have alarmed Hong Kongers recently. Ken Tsang, an activist beaten by police during Occupy Central, was sentenced to jail this week. Earlier this year, Hong Kong booksellers carrying publications critical of Beijing and its leaders were reportedly kidnapped before making what seemed to be forced confessions on state television. 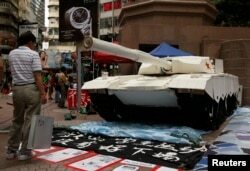 A shopper in Hong Kong stands in front of a model tank made by university students to remember the crackdown in Tiananmen Square, June 3, 2014. “Instead of fighting for something unachievable, Hong Kongers should shoulder the responsibility for our generation,” the student union statement said. “We should look to the future of bringing freedom and democracy to Hong Kong." Richard Tsoi, vice-chairman of the Alliance that organizes the vigil, was a university student in 1989 when he heard news of the massacre. He said he was “heartbroken” that some student groups would not be officially taking part. "It's important to let Hong Kong's new generation -- and also the Mainland's new generation -- know the truth and also to memorialize it,” Tsoi, a lawmaker and activist, said in an earlier interview at the June 4 Museum that the Alliance opened two years ago. “It is important also as part of the process to make the Chinese authorities issue a reverse verdict about June 4,” Tsoi added. “It is important for the future development of China." The June 4 Museum encapsulates the larger struggle in educating the public about a tragedy that gets scant attention in school curricula and museums. In 2014, the alliance used a crowdsourcing campaign to buy a modest, upstairs storefront – and filled it with photos, videos, displays and Chinese-language testimony. About one-third of the tiny museum’s visitors are from Mainland China, and Tsoi said that some of the older ones wept or became emotional after seeing the exhibits. The museum scrapes by an existence. According to Tsoi, it is engaged in a costly legal dispute with the building management, which wants the controversial venue to move. Visitors are sometimes stopped and asked for identification in the downstairs lobby – a tactic that sometimes intimidates away Mainland Chinese tourists. FILE - Tens of thousands of people attend a candlelight vigil at Victoria Park in Hong Kong to mark the 25th anniversary of crackdown in Tiananmen Square, June 4, 2014.